Though acid rain has begun to fade from public consciousness since environmentalists, scientists and even legislators rallied around the issue in the ’80s and ’90s, the problem still persists. One of the longest running volunteer monitoring corps in the country is keeping track of the issue in waterbodies across Massachusetts. Since 1983, volunteers have been grabbing water samples for the Acid Rain Monitoring Project coordinated by UMass Amherst’s Water Resources Research Center. Their valuable long-term record shows that despite significant cuts in some of the emissions that acidify precipitation, 65 percent of the streams and ponds the program tracks have not significantly recovered. Amendments to the Clean Air Act in 1990 helped cut emissions of sulfur dioxide, which produces sulphuric acid. But the lack of recovery in some waterbodies may have something to do with an increase in cars on the road producing nitrogen oxides, which produce nitric acid, Hatte said. “I wouldn’t say they have completely negated the decrease in sulfates, but they’re definitely having an effect,” she said. Those insights are supported by 30 years of data from water samples collected and analyzed by volunteers, many of whom have been with the program since the beginning. Every April, volunteers head out to 150 sites across the state armed with water bottles and sampling protocols. 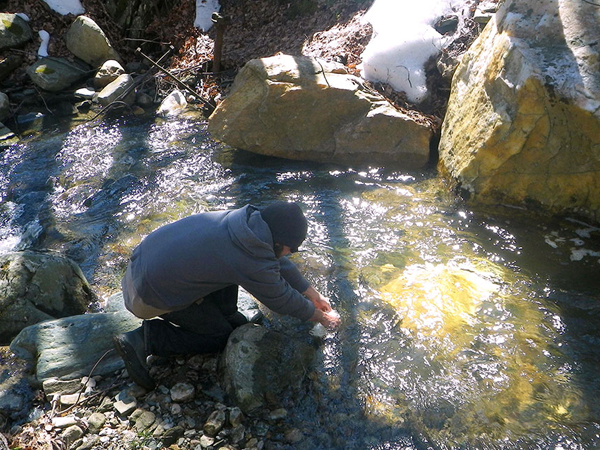 The April sampling date helps catch acidity levels at their highest, as nitrates that have accumulated in the snowpack are making their way into streams and ponds with the spring melt. This year’s sampling day was April 6, and a late spring found some volunteers facing snowy, slippery banks or ice cover on the ponds. But that didn’t temper the enthusiasm of the project’s dedicated participants, according to Beckie Finn, the research center’s water projects and lab coordinator. The samples are analyzed by labs at universities, high schools, waste water treatment plants and private companies. The people conducting the analysis — which is subject to the project’s strict quality control standards — are also volunteers, which shows an extra level of commitment, Hatte said. The Acid Rain Monitoring Project has weathered some setbacks, including cuts to its funding from the Massachusetts Department of Environmental Protection. But Hatte said she’s surprised the agency has any money left to fund ARM given the internal cuts the DEP has endured. But it seems the agency recognizes the value of an enthusiastic and widespread volunteer workforce. Hatte said that when the DEP wanted to know what they should be funding when it comes to acid rain research, a group of experts gathered at UMass to advise them.